Here is a bit healthier of a favorite dinner of ours. Sausage is usually a bit cheaper and more often found on sale at my local store, Boyers. If I am lucky enough, and I get to Boyers on the right evenings throughout the week, I can pick up a few pounds of italian sausage, or peppers and onion sausage for a few dollars! If the meat is has a date on it, within a day or even 3, most stores will put a store coupon on them, and a $3.49 pack of italian sausage, will end up being $1.49! So, this is when I will stock up our freezers like crazy! Spray a large frying pan with nonstick cooking spray, over med high heat, fry sausage until no longer pink. Cook and drain pasta as per instructions on box. Add diced tomatoes and cook for about 5 more minutes. This is a very yummy dinner, and the vegetables add so much flavor! You may end up having to make this a weekly dinner at your house! Peppers can tend to be expensive! So, if green peppers are cheaper where you shop, you can always switch the peppers up a bit, and maybe add 1 extra green pepper and omit a colored pepper, or buy from your local farmers market, or what my family does, is grow our own! I am anxious to soon learn the art of canning and freezing our vegetables and fruit, so for now, we only have these eppers through gardening season. When I do learn canning and freezing, I hope to have a much bigger garden by next season, and we will be able to save a lot more through the colder months! 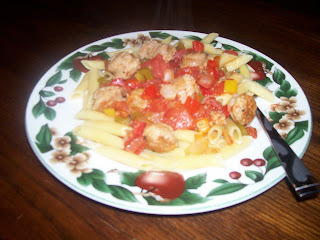 Another tasty recipe you can make with these ingredients, would be sausage with peppers and onions, as sandwiches! Just omit the pasta of course, and add rolls! If you don't have diced tomatoes, you can always substitute V8 for the tomato taste! This taste wonderful for the sandwiches!